Posted on May 30, 2017 at 11:47 am. A performer with Instituto de Cultura y Arte In Xochitl In Cuicatl which has received a 2017 RACC Arts Equity Grant. 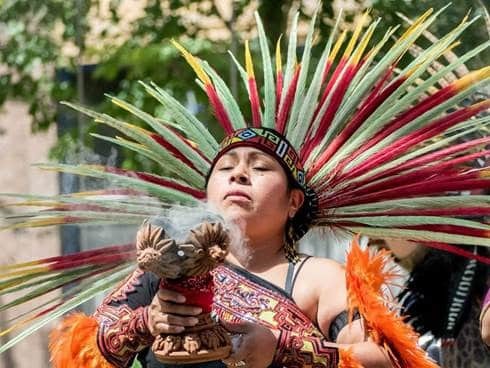 PORTLAND, ORE — The Regional Arts & Culture Council (RACC) has awarded $126,540 in Arts Equity Grants to 24 organizations that are advancing RACC’s goals for equity and inclusion. These grants are funded by City of Portland’s Arts Education & Access Fund, or arts tax, along with support from Multnomah County. Arts Equity Grants provide financial support to organizations that are conducting arts and culture projects and programming for communities of color, immigrants, refugees, underserved neighborhoods, persons with disabilities, LGBTQ communities, people experiencing homelessness and houselessness, and other communities that have historically been marginalized. A total of 75 nonprofit organizations submitted eligible Letters of Interest in this cycle and 31 organizations were invited to submit full applications. A panel of RACC Board Members and community representatives reviewed the 29 submitted applications and recommended full or partial funding for 24 applicants, totaling $126,540. The RACC Board of Directors approved the final grant awards on May 24, 2017.